1200 Calorie Delivery – it arrived! So how do the deliveries work? When you make your order, you can put in some instructions for the driver. You are limited to 200 characters which is not enough to be honest, and so my first delivery ended up being placed on the back outdoor table at 7am. Had I not been home, and had I not gone out to get it right away, it probably would have ended up in full sun within an hour. My instructions tried to say to put it under the verandah attached to the garage but apparently epic fail.. So they don’t give you an approximate time or even morning or afternoon – it is best to plan to start eating Lite N Easy the day after it is delivered. 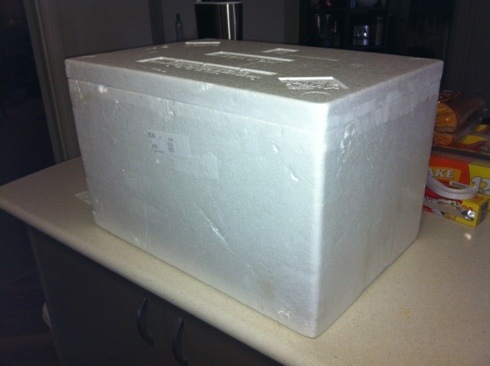 It arrives in a massive esky and there is dry ice in there to keep it cold if it has to be outside all day. 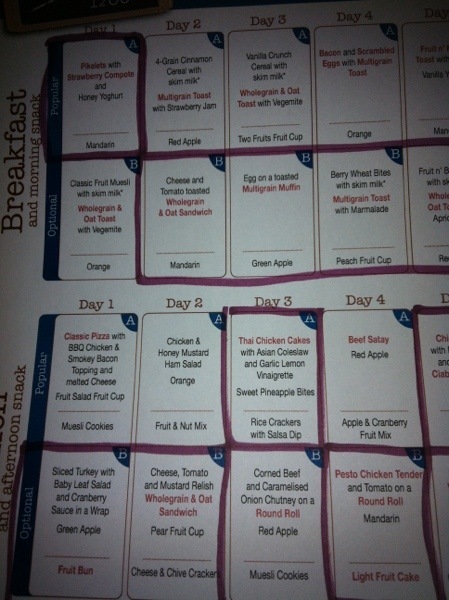 The ones circled in maroon are what I’ll be eating – eg pikelets for breakfast then sliced turkey wrap for lunch. Mostly these are vegetarian except for the fishermans pie – I still have some chicken stuff left from the last 2 weeks I can substitute if I get bored. 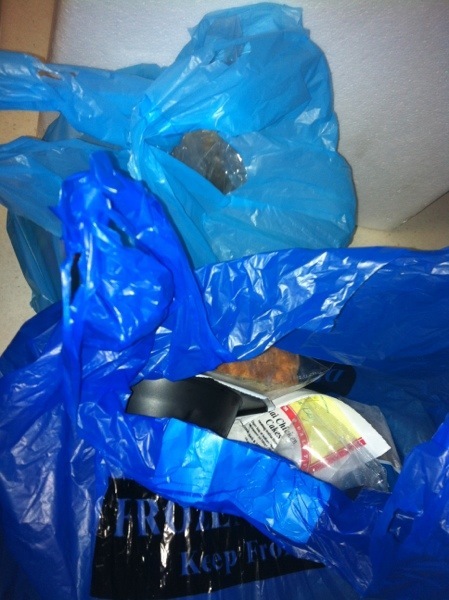 So there you have it – my food arrived, yay! There is less food than last week for obvious reasons – dropping 300 calories will do that. There is one less snack a day which is a good thing. 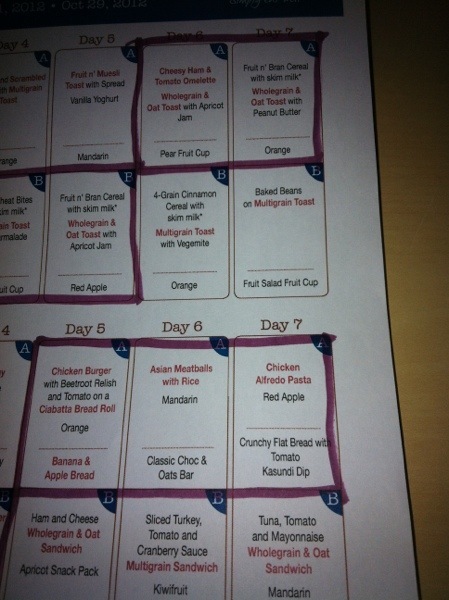 I do think it was a good idea (for me at least) to do at least one week of 1500 calories first, to get used to eating less at meals but not feeling hungry. Make sure to drop in and read it – this post contains my overall thoughts on Lite N Easy and also links to all the daily posts. You can find the wrap up post by clicking here. How to organise Lite N Easy in the fridge. Thanks, I have never seen a Lite & Easy meal, in the flesh so to speak, so I did not know what I was getting myself in for. Both my partner and I are planning to go on the meals, which will make it a lot easier, no watching someone else tuck into a dinner size plate of something nice. The only problem is that we are going to be struggling for freezer space. 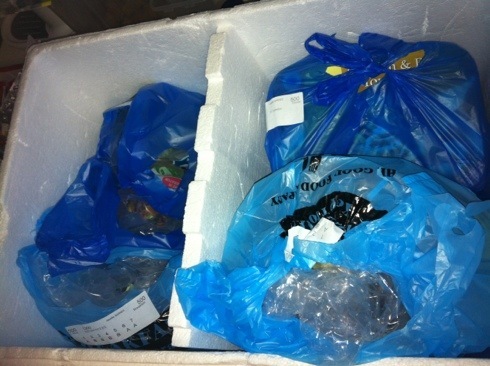 we are currently eating up what is in the freezer, so will probably stack on extra weight that we will have to lose. Do you have to eat the bread that they supply? I love bread, particularly the wholegrain stuff that the supermarket bakes fresh, and would much prefer to eat that than stale old rolls that have to be heated.